Last week, we published the 2016 Marotta Gone Fishing Portfolio and the 2016 Gone Fishing Portfolio Calculator. 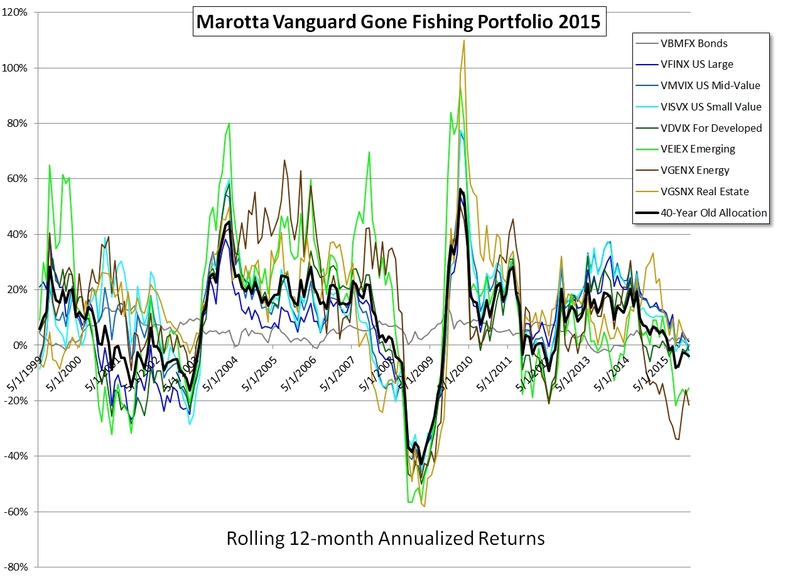 This week we are updating the Marotta Vanguard Gone Fishing Portfolio. A gone-fishing portfolio has a limited number of investments with a balanced asset allocation that should do well with dampened volatility. 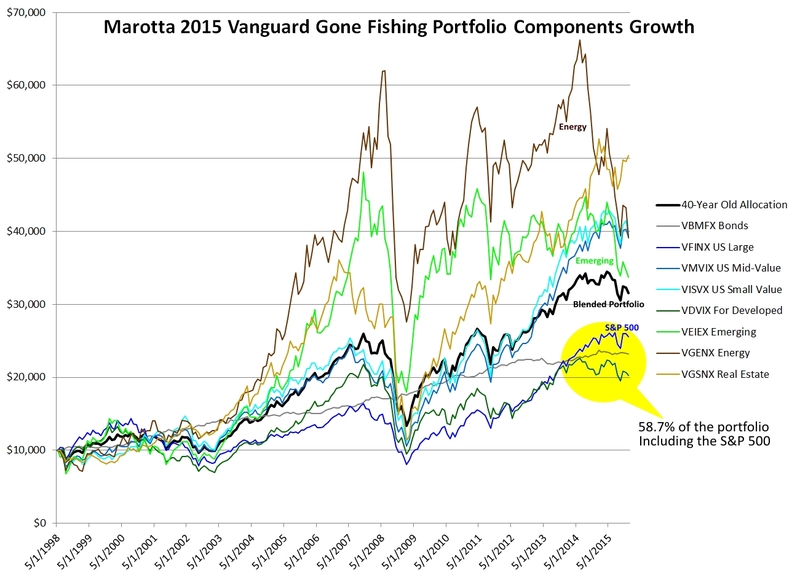 The Marotta gone-fishing portfolios are used by many subscribers as a free and simple way of low-cost investing. Last year, we added a version which uses only Vanguard mutual funds. The Vanguard version has an expense ratio of just 0.22% and is comprised of just eight holdings. If your custodian is Vanguard, then these securities also have no transaction cost. For analysis, we use the recommended asset allocation for a 40-year old. This allocation is comprised of 14.6% bonds and 85.4% stocks. The largest positions are in foreign developed stocks, the S&P 500, and bonds. These three positions comprise 58.4% of the portfolio. While most of the Vanguard funds have been in existence for decades, some of those we are using are younger than 10 years. To perform our long term analysis, we use two substitutions for younger funds. For Vanguard Mid-Cap Value Index (VMVIX) prior to 8/31/2006, we used the Lipper Mid-Cap Value Funds Index. And for the Vanguard Developed Markets Index Fund Investor Shares (VDVIX), prior to 12/31/2013 we used the MSCI EAFE GTR Index. Last year, the portfolio returned a disappointing -3.94% compared with the S&P 500’s positive 1.25%. The worst returns this past year came from Vanguard Energy (VGENX) which was down -21.48% for the year and Vanguard Emerging Markets Stock Index (VEIEX) which was down -15.51% for the year. While the past year’s return for these two funds was disappointing, we recommend keeping the same allocation to these two funds for 2016. The average return of these two positions since 5/31/1998 is above the portfolio’s average even after factoring in the recent drop in these positions. While the majority of the portfolio is invested in just three positions, the portfolio as a whole out performed these three positions over the time period analyzed. In our article “Why Invest In Chile,” we showed how investing a small amount in something very volatile might actually reduce portfolio volatility and boost returns. 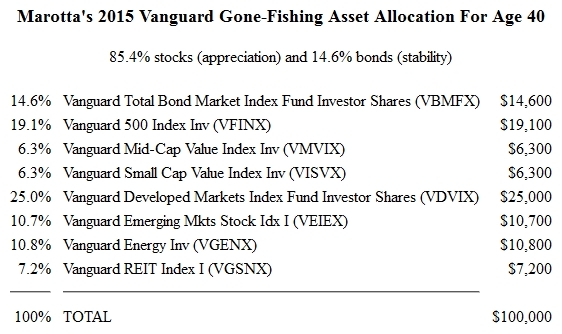 The Vanguard gone fishing portfolio employs the same strategy. Small positions in mid-cap value and small cap value are intended to boost U.S. stock returns without increasing the volatility of the portfolio as a whole. Bear in mind that these positions in small and mid-cap value individually may be more volatile than the S&P 500 while still reducing the volatility of the portfolio as a whole. This can cause investors to think the portfolio is volatile even when total portfolio returns have been made more stable. In a similar strategy, the portfolio invests a small position in emerging markets in order to boost foreign stock returns and reduce volatility. And allocations to energy and real estate are intended to do well when other categories may not be. You can see some of the dampening of portfolio volatility by looking at the rolling 12-month annual returns of the blended portfolio along with its individual components. Perhaps the best way to see the benefits of diversification is to look at the annual mean return and average standard deviation for each component of the portfolio compared to the portfolio as a whole. Since 5/31/1998 the portfolio as a whole had an annualized return of 6.74% and a standard deviation of 14.25%. The standard deviation of the portfolio was lower than the standard deviation of any of its underlying stock components. And the mean return was higher than the top three components which in total represented most of the portfolio. Energy and emerging markets had the highest standard deviation of any of the components. And yet we believe that adding these highly volatile non-correlated components actually reduced the overall volatility of the portfolio. Energy and emerging markets are volatile in both directions. Energy may have been down -21.48% last year, but the portfolio as a whole was only down -3.94%. Meanwhile there were 12-month periods when Vanguard Energy had a 66.78% return and helped boost the portfolio’s returns. Holding onto a position which has just experienced significant losses is difficult. Even harder is rebalancing by buying even more. And yet this is what, over long periods of time, produces better returns. As of the end of the year, energy and emerging market stocks are on sale. These two mutual funds have five year annualized returns of -4.31% and -4.97% respectively. Those are disappointing returns, but five year returns are not the same as long term investing. Every index has long periods which disappoint. I’ve focused a great deal on the disappointing components of the portfolio, but four positions have done extremely well over the past five years. Five year annualized returns for U.S. large cap (12.40%), mid-cap value (12.11%), and small cap value (10.26%) have reversed the disappointing returns for U.S. stocks prior to five years ago. The other category which has done well the past five years is real estate (11.65%) which has recovered nicely from the 2008 crash. Our reaction to short term returns should not ruin a brilliant long term investing strategy. 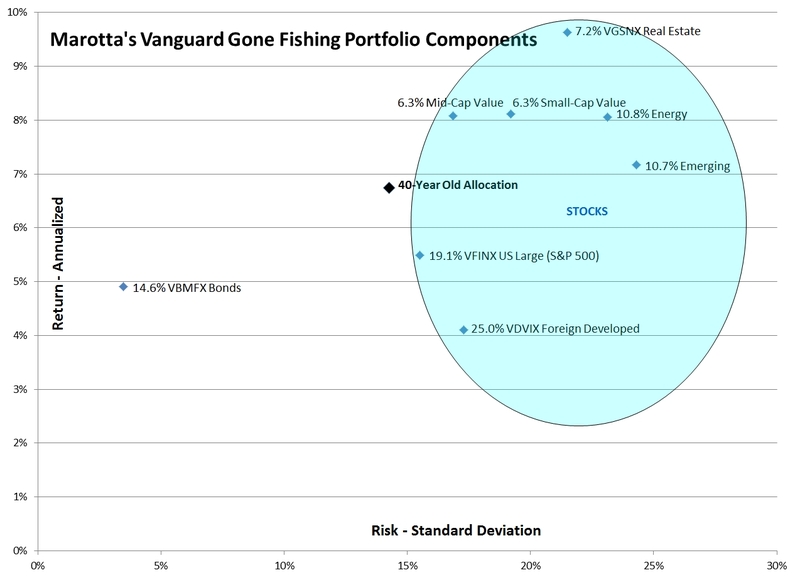 The strategy of last year’s Vanguard gone fishing portfolio is sound and we are not recommending any fund changes to the portfolio for 2016. We did make one change to the age-specific asset allocation recommendations. We removed any allocations to stability for those 27 and under. These ages had a bond allocation that was less than 2%, but young people who are saving and investing don’t need a bond allocation. If they want to keep some money set aside as an emergency fund, that amount is dependent on their lifestyle spending, not the value of their saved assets. As a result, we don’t begin recommending any bonds until a 2.1% bond recommendation at age 28.